reviewed :: 2010 sewing, so far, originally uploaded by earthchick. The year is halfway done (what?!) and I thought I’d take stock of my sewing so far. This time last year, I was sewing my way through my Summer of Skirts. This year is apparently all about bee blocks. I’m in two quilting bees and am learning a lot! 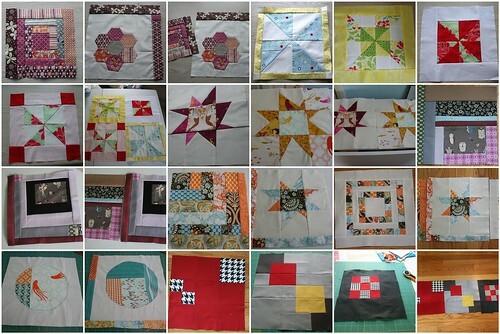 Before these bees, I had sewn three lap quilts, all using the Easy Lap Quilt pattern (or unpattern) from Bend-the-Rules Sewing. But until these bees, I had never actually made a quilting block. Turns out I really struggle with the precision involved in putting together a block, especially when it comes to getting precisely the right size block. The bee participants have been choosing some amazing fabrics and color combos. I’m looking forward to choosing mine for my months (in November and next March). Meanwhile, I’ve been absolutely itching to do some clothing-sewing, both for myself and for the boys. But between sewing blocks and spinning for Tour de Fleece, I can’t figure out when that would be. So if anyone has any ideas about bending the time-space continuum, let me know!